Thanks for the invite to help. I won't be able to do anything for this project. Full time work, community things, cycling club, volunteering with their website, plus it is Summer and it's nice to be outside. Project looks good. All the best with it. Your level design skills are fine. It will get better with each attempt. Especially when you test online with other people. I've been looking forward to this project since a video of it was first posted on the news section of this website many many years ago. My hope is to one day make my own 2.5D Top Down Action games. I look forward to watching this game's development & supporting it in whatever ways that I can. Best of luck. I was hoping for your expert mapping help, i know you pay meticulous attention to detail which is what i wish on beta testing maps - i'm hoping that map file format is now final and i can release a few tools including map editor. Thank you, the best way to spread the word to other people that might be interested and still like top-down gta world, and to make maps, scripts and test it thoroughly when i release an alpha towards end of august. Progress was good in past few weeks, i've added automatic damage modelling / deformations for vehicle collisions, fixed a dozen behaviors / internal problems in stuff like static map objects. I've also upgraded tools, and finally made the vehicle sprite editor not crash randomly, making it pretty stable, map editor still needs more work but is also good enough for now. A good new feature is working multiple seats on motorbikes, meaning 2 players can actually sit on motorbike, one driver and one passenger (nothing will not stop anyone making a 20-seats long motorbike). AI traffic and police ai had some minor updates and fixes aswell. For internet play it's a bit complicated, but instructions are in the readme. Congratulations on the release of the public alpha! Unfortunately I could not try the demo (since I no longer have a computer and funds for it), but I really wanted to. For this I will watch your videos from the phone until better times. Waiting for new videos, massive with players. Guys, I was thinking here. And what about creating a homepage on GTAMP (in HTML on 1 page) for a TDC project (with the permission of Sector's of course)? P.S. : A repository is already there. It would be great to go to a direct link and see a preview of the game (picture), a link below it to download: the client, server, utilities and other useful material, a description (right or left) and instructions for setting up the game. This can be a simple and neat HTML page for Top Down City and JerneiL is its editor. A simple page would be good or at least update the screenshot in first post of this topic and link to the download. Yes, but this is for the forum section. The game should have a presentation page where the user comes in (and sees what the game is in front of him). This increases interest in the game. You can also immediately see which version is the latest and what has been added. The forum page should always be, but it is suitable for discussions but not for the presentation. Maybe JernejL's plans to open a website for TDC? Then it will be great. My suggestion was this: Do not quit the GTAMP community and make the game inside it, as there are loyal fans of Top Down Shooters, and the TDC game is native to GTA2. And inside tdc.html - the presentation page (with all the information about the game). For example, on this page you can display the number of running servers, online players in the game. You can also add (in a separate window) the IP addresses of the servers that paid for the host (for their promotion). i finally understand you with pictures now, i'll add this and it will be an option in map editor. I'm making good progress on police logic, hopefully that'll be next good update. It's great! Good release. Go on. 1) The HP car strip should replace the HP player strip if the player is sitting in a vehicle. No need to withdraw the player's HP, if his life depends on the life of the transport in which he is. 2) The effect (particles) of the flame from the bots weapon (when firing) appears in the center of the sprites, and not from the barrel of the weapon (as it should be). 3) You have a noticeable problem with the camera (it is shaking) in case of respawn (player's death). 4) Noticeable is a slight delay before the player gets into the car? It does not immediately disappear as if it is on top of the vehicle. Can the player's sprite be cut off (at the intersection of the car body) or placed (at the time of landing) under the vehicle as if it sits inside? 5) This is just a suggestion: The cops should be able to knock down someone they are trying to detain, if he, without a gun, is near. They should also be able to throw a player out of the car. Waiting for your new videos! Decals of blood appear over vehicle. When entering the vehicle the sprite of the character above the vehicle (I wrote about this problem earlier in the previous post). Note: HP strips should have the same length (the strips in the screenshot are for example only). 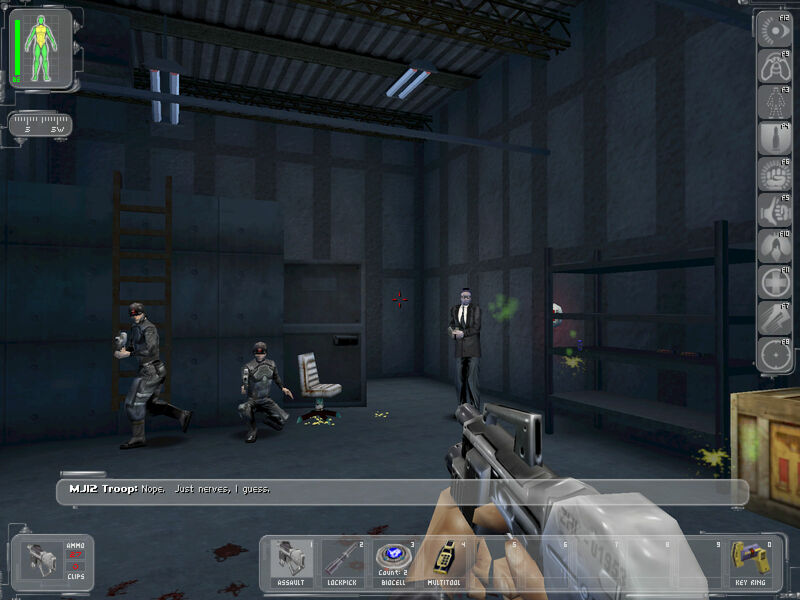 Examples of game HUD. Just for fun. My suggestion about the tank. An example of trace from tracks (color depends on the type of tile surface) and a tank shell smoke trace. I like the tank tracks idea, that is doable, and i'll put that on to-do list. I'm adding surface materials support because of audio sounding different based on what you are walking on, and it obviously fits with skidmark effect / colors, and can be extended to produce tank track trails depending on materials aswell. Weapon smoke: some support was made for this, but it looked odd and needs to be reworked to make a particle trail look good, plus i need a new, better graphics for this first, i'll return to this a bit later. For gui: i don't think a simple compass threat radar will work good (especially combined with rotating camera option), i'm hoping to make a proper radar map with buildings roads and targets shown. Your suggestion for weapon hud changes seem good, it's something i considered to make similar to deus ex ( https://i.imgur.com/FTjh5vk.jpg example ) where key numbers are connected to number keys, similar to what you drawn, i do need a gui / styling to get that to look good, it' something that i can work on later, not much priority on hud currently. Similar to health bars, what i have now is a terrible design (and previous one i had was even worse). I'm considering a single health bar, which would show in percentage how much vehicle, character health and armour you have in different colors combined together, but i think i can simply ditch the vehicle health, as the cars now produce visual damage, have damaged engine sound and also catch fire - and that already gives a good indication of their damage. blood decals on floor and vehicle: this is being worked on, so far all decals on cars are black, to simulate dents, i can make red ones tho - it's on the todo list together with ground bloodstains. Enter / exit animation: the current animation is placeholder, the character and its animations need to be remade. Once that will be done, it should look much better. Thanks for reports and suggestions, it will take some time to make everything, but i appreciate anything that can help polish the game to look good and play well. > blood decals on floor and vehicle: this is being worked on, so far all decals on cars are black, to simulate dents, i can make red ones tho - it's on the todo list together with ground bloodstains. I'm about another phenomenon. Blood stains should not be visible if vehicle overlaps with their size. On the screen download/file.php?id=1908 the tank ran over the bodies and the blood shines through the hull. Also, it is not necessary to do damages on cars with red (but possible), if you shoot down living force, you can add splashes of blood (but there is a risk of getting a slasher in the style of carmagedon). This screen download/file.php?id=1909 shows the main character who sits in the fire truck his sprite appears to a level above the vehicle's sprite (and should be lower) - as if he sits inside . I like the progress! Waiting for new videos. At the expense of the radar, I meant the following (then the W, E sides are not needed, and N will be spinning along the semicircle). But this is all just for reflection as an alternative to the (static) square radar.